← Do Composers Live in a Bubble? We are pleased to announce the release of Heike Graf’s latest work The Environment in the Age of the Internet: Activists, Communication and the Digital Landscape. This collection of essays focuses on the communicative approaches taken by different groups to ecological issues, drawing on case studies from around the world and focusing on activists of radically different kinds. From protesters against pulp mills in South America to gardening bloggers in Northern Europe, each case is examined in relation to its multifaceted media coverage, mainstream and digital, professional and amateur. This volume acknowledges that mainstream media is seen as the most powerful vehicle for increasing awareness and is, therefore, addressed accordingly. But the relationship between new and old media is constantly evolving, and the cases discussed in this volume have never been more timely. Take, for example, Coppélie Cocq’s examination of social media as a platform for environmental activism, with particular focus on YouTube. Cocq details the progression of a series of YouTube videos produced by activists in the Sápmi area, protesting the devastation caused by the mining industry. Less than two years after the first video in the series was made public, the topic has shifted from the periphery to the centre of the public debate. This volume also focuses on the seldom explored topic of environmentalism among neo-Nazi groups. After moving past the bizarre image of skinheads biking in formation, bringing their milk-cartons to recycling centres, Madeleine Hurd and Steffen Werther present a compelling examination of the symbols, slogans, narratives, and visuals used to package the combined environmentalist/right-wing extremist message. These messages are examined in the context of the two emotional media frames, i.e., of fear and anger and of nostalgia and love, the former inciting the need for militant action against its enemies and the latter imbuing visions of what must be protected. Both frames are combined in a narrative of ‘irreparability’, effectively linking the visuals and narratives of militant xenophobia to biocentric environmentalism. In light of the current media frenzy surrounding xenophobia, Hurd and Werther’s essay is essential for anyone wishing to gain further insight into how media circulates information about xenophobia, and the odd compatibility of environmentalism and militant nationalism. Having this information contextualised with the other environmental stories from around the world demonstrates how context determines communication, and how communication raises and shapes awareness: these stories and the people that tell them play the central role in constructing and spreading communication about environmental issues in order for them to be recognised as public or political concerns. 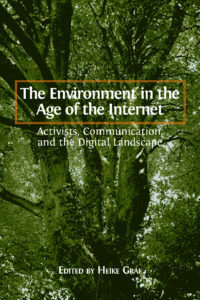 The Environment in the Age of the Internet is essential reading for everyone interested in how humans relate to their environment in the digital age. Add your email address and receive updates on our latest posts!